Almost six centuries have passed since the death of Joan of Arc, but the enduring fascination with her life continues to generate new studies, adding to the huge quantity of existing books and articles. Those by reputable historians and biographers have recounted the many known facts about her, based on the surviving 15th century documents. But while Joan's key role in expelling the English from French soil has been firmly established, the mystery surrounding her achievements remains unexplained. Joan Edmunds contends that such an explanation is not possible whilst relying solely on the orthodox historical methods customarily employed by writers on the subject. 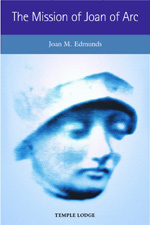 Basing her work on Rudolf Steiner's spiritual-scientific findings - which for the first time revealed the true significance of Joan of Arc's mission - Joan Edmunds explores the mystery of the Maid of Orleans' unique personality. She shows how, whilst under the guidance and direction of the Archangel Michael, and through her ultimate martyrdom, Joan of Arc was instrumental in bringing to birth the forces necessary for the next vital step in humanity's spiritual development: the emergence of the Consciousness Soul. JOAN M. EDMUNDS was born in Worksop in Nottinghamshire. She was a member of the Theosophical Society for many years, but her lifelong quest to discover the true significance of Joan of Arc's mission eventually led Joan to study the works of Rudolf Steiner. She joined the Anthroposophical Society in 1979 and for some years was editor of Rudolf Steiner Press in London. Now retired, she and her husband live in East Grinstead in West Sussex.